What do people do on their birthdays? For parents, they buy gifts for their children on their special days. For others, their loved ones will either cook them a lavish meal, or go for a nice dinner. Still there will be others who will do something to make it a really memorable time for the birthday person. Once a year, families all over the world will celebrate each other's birthdays. Of course, we do not forget that the most common thing to do on the special day for anyone is this, "Happy Birthday!" In a social media age, technology has helped bridge the world of distance, bringing people together through quick and efficient connections online. Friends that we know from long time ago can easily locate us either through an Internet search, or through our other friends. With websites like Facebook, you may not need to comb past yearbooks just to remember one specific "long lost friend." Instead, all you need is one friend from that class, and there is a good chance that this friend will know our "long lost friend." Receiving birthday greetings is one way to begin the day. Due to the time differences, birthday greetings can start coming in from Asia almost a full day before North American time. It is quick. It is easy. It is one effective way to help us keep in touch. Yet, for all the technology and the efficiency, there is one thing that I do not like. Birthday greetings from machines. For all the power and beauty of technology, robotic greetings still get on my nerves. Marketing calls in particular irritate me a lot, especially those that are made by machines. "Hi. You have been selected for a special promotion. Press 1 for English, 2 for French, or 0 to speak with an operator." Huh? Goodness gracious. If you do not even bother to invest in a human person to call me personally, how can you expect me to reciprocate? If you let a machine call me automatically, I will hang up on the machine automatically. It is that simple. A mechanized solutions is no way to cultivate personal connections. In fact, I think such use of technology is a sad act of dehumanizing people. For the sake of cutting costs and increasing efficiency of reach, people's feelings have become less important than selling goods. I receive birthday greetings too from University computers or professional societies I am registered with. For all the nice words on the email letterhead, or the e-card, I cannot but feel being just a piece of data on the organizations database. As a programmer myself, I can think of algorithms in which I can create a spreadsheet of last names, first names, year, month, and day of birth. The information is then passed through a sorting software that spits out birthday greetings for the alumni or the member on their special day. Just program once, and the machine takes care of the rest. All year round, this machine will be the one saying "Happy Birthday!" to the birthday persons on their special day. No human person in the management, or the staff, needs to remember the details. It is the machine that remembers and takes actions. The human persons do not bother to remember, leaving an impersonal machine to give out an impersonal greeting to a real person. For me, such greetings are meaningless. They are either ignored or deleted. Neil Postman warns that technology is never neutral. It either adds or subtracts. If we do not take time to reflect on its impact, chances are, we will lose more than we gain. Mechanized solutions, for all its efficiency and effectiveness, when it comes to human connections, it is a net loss. I don't know about you. The older I get, the more I begin to think about my friends and loved ones. I more I start to ponder about what kind of a race am I running. The more I get to ask myself, what have I accomplished all these years. This retrospective mood is particularly strong on birthdays. When I am younger, I want to grow old faster. When I get older, I want to stay young longer. As I watch my kids grow up, I too begin to wonder what my next half of my life will be like. In his book "Finishing Well," Bob Buford relates his experience with Tom Luce. When asked about what gives him most satisfaction in life, Luce gives two answers. The first is about building an institution that will bless others and outlast himself. The second is something more personal. The older one gets, the more one becomes aware of the importance of relationships. This is something most of us know in our heads, but it takes time before it sinks through to our hearts. Is there something more to life than making a living? While thinking about birthdays this week, I think of what I like to do on my own birthday. After receiving tonnes of birthday greetings on social media, I decide to turn the happy greetings into praying for my friends and loved ones. I think of Jesus who spends a great amount of time simply praying for people. So much so that when he sees merchants messing up the worship mood in the temple, he angrily overturns tables and scolds the people for turning God's House of Prayer into a den of robbers. A prayerful man recognizes immediately the things that make God unhappy. 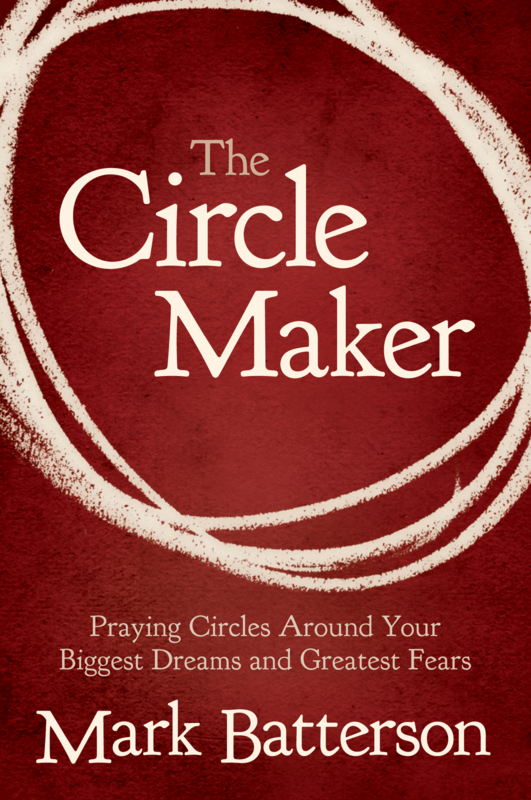 The idea of praying for my friends on my birthday comes about when I pick up Mark Batterson's bestselling book "The Circle Maker" yesterday. In it, Batterson shares the story of a Jewish hero, Honi. About 2000 years ago, before Jesus walked the streets of Jerusalem, Israel was experiencing a terrible drought. In that first century, the drought was poised to destroy an entire generation. When rain was plentiful, the people hardly thought about water needs. When rain became rare, people often thought and talked about it. As the people looked on in despair and hopelessness, Honi took on a new role. He prayed. What made the prayer special is that it is filled with conviction and belief. It is a resolute act of defying the drought and expecting great things from heaven. Soon, there came a drizzle, which silenced the onlookers. Yet Honi was not satisfied. Standing within that circle, he called out for more. The drizzle turned to droplets of rain. Yet, Honi remain resolute, determined not to budge from the circle. Droplets of rain became a torrential downpour. Still, the pious man remained in the circle. He wanted more. The prayer warrior has showed his hand. He seeks not for the gifts but for the Giver. He asks not for mere showers for the land, but showers of blessings for the people he loves. That is my prayer for my friends, my loved ones, and my readers. I pray that the Lord will send showers of blessings to you and your family. I pray that when you feel lost, the Lord will make you found. I pray that when you are sad, God will send joy and hope in His time. I pray that you will find fulfilment in things eternal, and place less faith in temporal things. I pray that your relationships will grow strong and healthy. Even if you may feel down or discouraged, I pray and believe that the Lord holds you in His good hands. Each week, as we enter the Lord's presence in the House of Prayer, may it lead to us doing something more. Overturn the tables of materialism, individualism, consumerism, and all kinds of mannerism that dehumanizes people. Turn toward God. Turn toward caring for people. Turn toward making our own hearts hospitable for God and for people God loves. Let us open our hearts for the Lord to dwell within us. There is no greater joy than to have the Lord do just that. For us, for friends, and for loved ones. This will be what I will do for my birthday. I will pray for all my friends. This is my prayer for you.